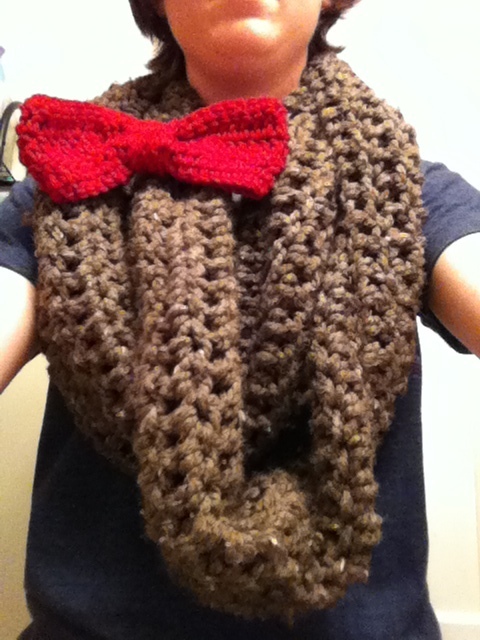 I found a really cute, super easy pattern for an infinity scarf on Pinterest (that I’ll post later), and decided that I could make it Doctor Who themed by adding a cute red bow! I think it turned out great! The bow is safety pinned so I can adjust it and put it anywhere I like. Edit: As promised, here’s the lovely pattern I used for the above infinity scarf from Brooke Ann Dove at “On the Wings of a Dove” Blogspot. The crochet bow’s pattern comes from JennaScribbles (scroll down to view the green bow). The only thing I changed was that I didn’t skip any chains in row 2.